Coconut Curry Chili | What about this? He wanted curry. I wanted chili. Lucky for him, I compromised by making a chili dish with an interesting flavor twist. Coconut Curry Chili looks like a typical chili and packs the heat of a chili, but sports an Asian-inspired flavor combination. It’s a snap to throw together, but don’t hurry this curry. The flavors need time to meld. A bowl of this hot spicy chili fills you up and fires up your taste buds. 1. Cook the ground turkey in a skillet over medium heat. With a spatula or spoon, break it up into small pieces. Cook until completely browned, about 5 to 7 minutes. Drain off as much grease as possible. 2. Combine tomato soup, water, and minced garlic in a large pot and bring to a boil. 3. Add the turkey to the pot and return the mixture to a boil and reduce heat to medium-low. 4. Stir chickpeas, red kidney beans, carrot, chutney, curry powder, onion powder, salt and pepper into the turkey mixture; bring to a simmer; place cover on the pot and cook until the chickpeas are tender, about 15 minutes. 5. Stir in 1/4 cup coconut milk into the chili, return cover to the pot and simmer another 15 minutes. Pour the remaining 1/4 cup coconut milk into the chili, stir, and simmer 30 minutes more. 1. I used ground beef, because that’s what I had on hand. 2. *In order to make this recipe lower in sodium and more flavorful, I substituted a 32-ounce box of low-sodium roasted red pepper and tomato soup for the two cans of tomato soup and the 1¼ cups of water. 3. I added a whole carrot, chopped. The more veggies, the better! 4. **To make this chili more substantial, I would add one more can of garbanzo beans or one more can of red kidney beans. 5. To make this a vegetarian dish, replace the ground meat with firm tofu, cubed. Add it towards the end. 6. This chili is great over freshly-cooked brown rice. Top with chopped cilantro and light sour cream or plain Greek yogurt, if desired. Thank you for providing dinner inspiration for tonight, this looks amazing! 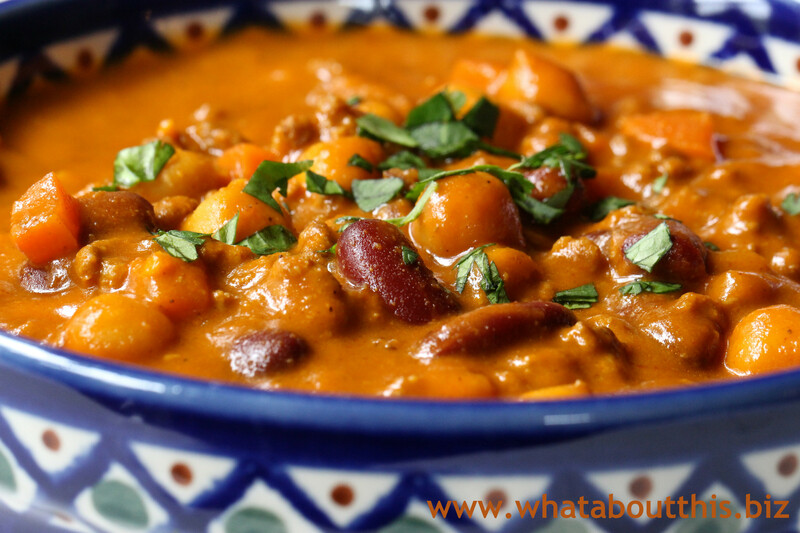 Hi Kim – Hope you and Mark enjoy this easy Coconut Curry Chili!